Papalo. I saw a bunch of this stuff at Farmer Jesus’ table at the market recently and I couldn’t resist. I always ask him what he does with things, only to remember that he’s basically too busy farming to cook much. So then he tells me what other customers tell him they do with it. But he was a bit more familiar with this one. He said people use it in salsa “like cilantro.” You had me at cilantro. One, I love the stuff and could put it on absolutely everything. Two, my husband despises the stuff, so I’m always looking for a way to sneak it in. An herb that’s like cilantro but not cilantro? That should do quite nicely. But first, I had to try it out myself, so I took a nibble while standing in line to buy it. The leaves remind me of a lilly pad, though they sprout out from the stem a lot like cilantro. The taste, as predicted, is not unlike cilantro — with that sharp and refreshing bite — but merged with a slightly bitter lemon taste and a bite of grapefruit at the end. 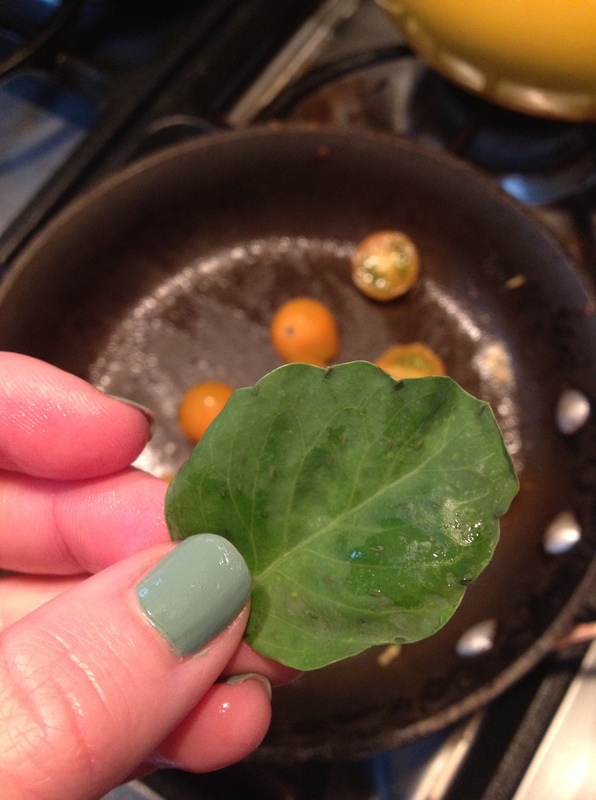 When cooked, it just tastes greener, like a bit of spinach added to the mix. Basically, it has a lot going on. So, as with most new things, I start simple. If it’s a new root vegetable, I roast it with olive oil, salt & pep. If it’s an herb, I throw it in my eggs. I must say, you can’t go wrong if anything is mixed with the orange cherry tomatoes that are at markets now. 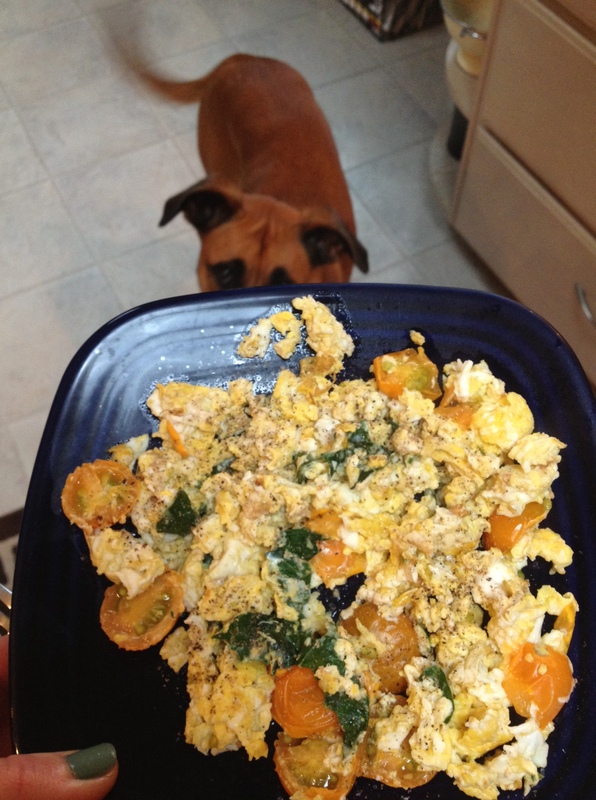 The papalo tasted pretty good in the eggs, with that spinachy cooked flavor coming through. It didn’t make me want to grow any, per se, and it certainly didn’t make me want to uproot my basil or cilantro. But I was intrigued to do more research. Turns out the herb grows wild, originated in South America and are part of the daisy family (my lilly pad guess was wrong). Some say it tastes like a cross between cilantro and arugula, which may be why it’s so palatable raw. That being said, it is an acquired taste, like cilantro (which I stopped forcing on my husband after reading this article). A little bit goes a long, long way. This LA Times article has a bit more about the herb, and the helpful hint to use about one-third the amount of papalo as you would cilantro. It’s pretty potent stuff (just smell it). Last night, I gave the papalo a go. 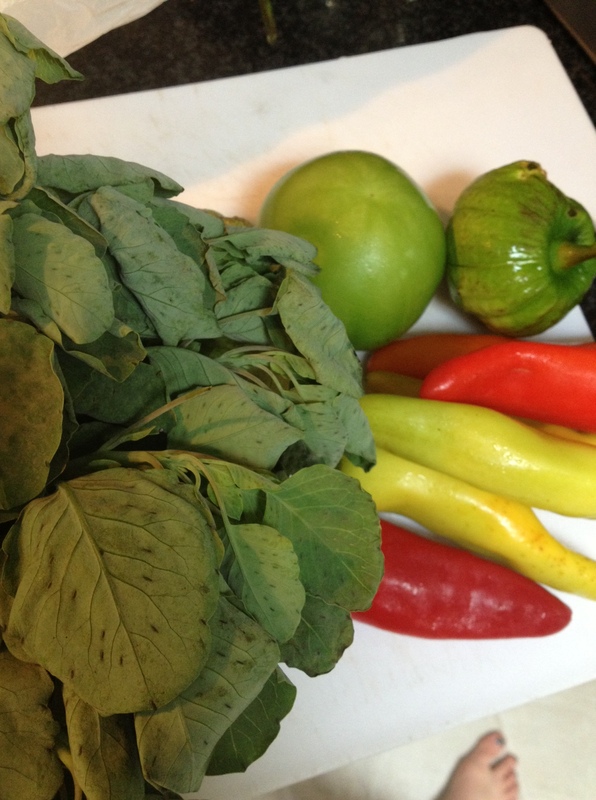 I used it instead of cilantro in tomatillo salsa and then I used that in some messy enchiladas. There’s something about eating a flavor you’re not used to eating — not just a new combination but a new herb — that really spices up a weeknight dinner. 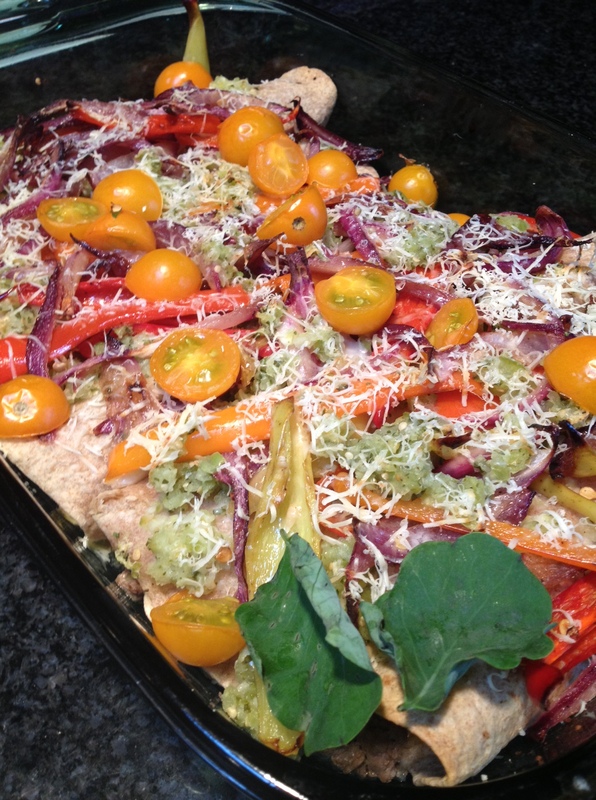 While I didn’t prefer the papalo to cilantro in the raw salsa, I did like the depth it added to the cooked enchiladas. It reminded me of my favorite Greek lamb lasagna at my favorite Greek restaurant in Anacortes, Wash. One time, I asked what was in it and she listed off a stream of spices that I never would have put together. The dish had that I-have-no-idea-what-this-flavor-is flavor. The papalo brought a bit of that to enchiladas. I used the salsa in enchiladas (with ground beef and fresh corn inside, sweet peppers and onions outside), but you can use it in place of any salsa verde. Or just eat it with chips. If you find the papalo extra strong — don’t say I didn’t warn you! Looks yum! Never heard of that herb either, thanks for the introduction. Let me know if you see it at the markets in your neck of DC. I’m curious how widespread it is around here!